Posted December 13, 2017 by Bailey Heard & filed under Blog, FeaturedOnHomePage. It was like Andrew was sitting across the table talking to me. Suddenly I remembered his love for missions, his big dreams to travel the world, his passion for stories, and his heart to teach, disciple, and mentor. I wanted to hold onto the feeling as long as I could because I’d almost forgotten what it felt like to be in his presence. 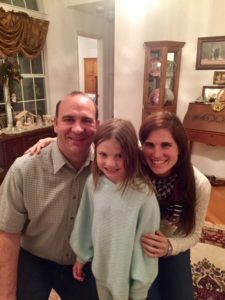 This all took place a couple of weeks ago when my daughter, Ellie, and I had dinner with one of my late husband, Andrew’s, best friends from Seminary, George, and his beautiful wife, Laura. George is Bulgarian and came to the USA on a tennis scholarship, then stayed to go to Truett Seminary. He was one of the first friends Andrew introduced me to once we started dating. Their friendship brought Andrew so much joy. It amazed me how two men from two different countries could share so many things in common. In George, Andrew found a friend who understood him and asked the same theological questions. Someone he could talk to about anything, and who loved and respected him unconditionally without judgment. Laura is both Swiss and American, and was dating George when she came from Switzerland to Texas to take a couple of classes at Baylor during George’s final semester at Truett. That’s where I got to know her, on our many double dates. We laughed about going to dinner with the boys and how they would get into these deep theological discussions, which went way, way, way over our heads. The plan was always for George to go back to Bulgaria to Pastor the Baptist Church where his father had pastored for so many years. George graduated a semester before Andrew and I remember how much Andrew missed him. Andrew went to visit George in Bulgaria after graduating seminary and came back so energized and full of life. The whole experience inspired him to write a book based on George’s family. When George found out that Andrew had cancer he flew to Texas to come spend time with him. George’s friendship gave Andrew life. Knowing how dear this man was to my husband, you can imagine how I was looking forward to seeing him and Laura, and introducing them to Ellie. On the car ride to meet them, I told Ellie how spending time with Daddy’s friends would be like experiencing a part of her Dad. She responded with a tinge of jealousy and admitted that it made her upset that Daddy’s friends got more time with him than she did. I reminded her it was okay to feel upset about not getting as much time with her Daddy. I also asked her to remember that even though she didn’t get as much time with him, it didn’t mean he loved her any less. In fact, he loved her with all of his heart. Ellie connected with George and Laura almost immediately, which is unusual for her. They gave her Bulgarian Rose hand cream, which Ellie rubbed all over her body on the drive back home, and some beautiful handmade glass earrings, which she insisted on putting on right away in the bathroom. Spending time with George and Laura was such a gift. It felt like being with Andrew again. Before we parted ways, George turned to me and said, “Keep writing.” He told me how he’s printed off my blog posts and given them to some of his Bulgarian church members to encourage them in their walks with God. This blessed me and felt like a nice warm hug from God, saying, Stay on the path, keep going, and be courageous because I am with you, always. I need that encouragement and maybe you could use some, too, so keep going, don’t give up, take steps of courage everyday, and remember that God is with you, always. Love and Blessings. PS – Only 13 days until Christmas! If you’re looking for a meaningful gift for someone you love, I encourage you to check out Andrew’s book, The Ellie Project. It’s an illustrated children’s book filled with valuable and powerful character lessons that will resonate with everyone—from young ones, and those still young at heart!